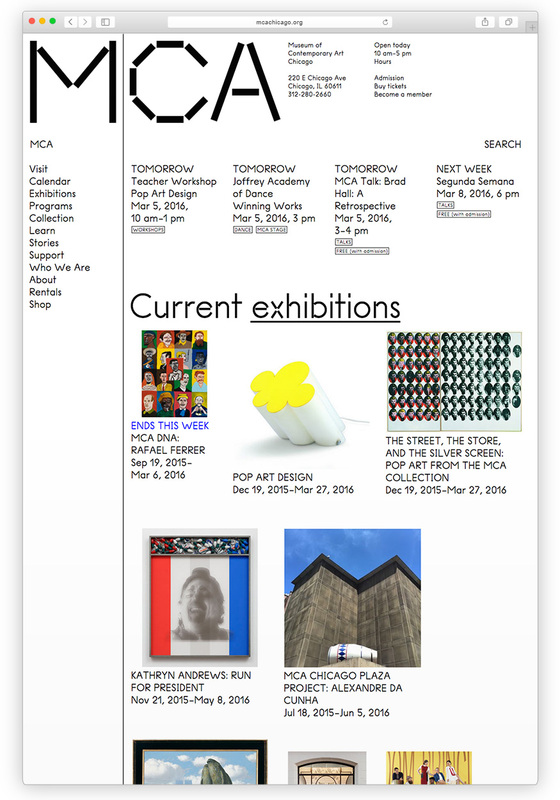 Designer: The MCA website is produced by the Design, Publishing, and New Media department at the Museum of Contemporary Art Chicago. 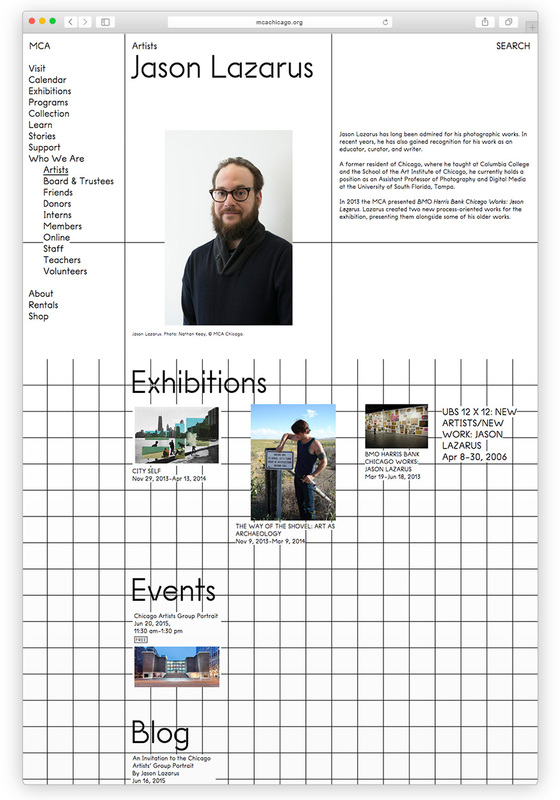 The site is the result of a collaboration between many members of the MCA staff and our extended community. 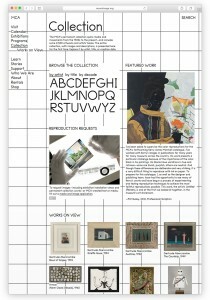 Key contributors include Dutch design firm Mevis en van Deursen, responsible for the design of our new identity; Studio Tomas Celizna (in collaboration with Asger Behncke Jacobsen and Sebastian Ly Serena), designers and developers of the site; Sina Bahram of Prime Access Consulting, who provided accessibility training and consulting. 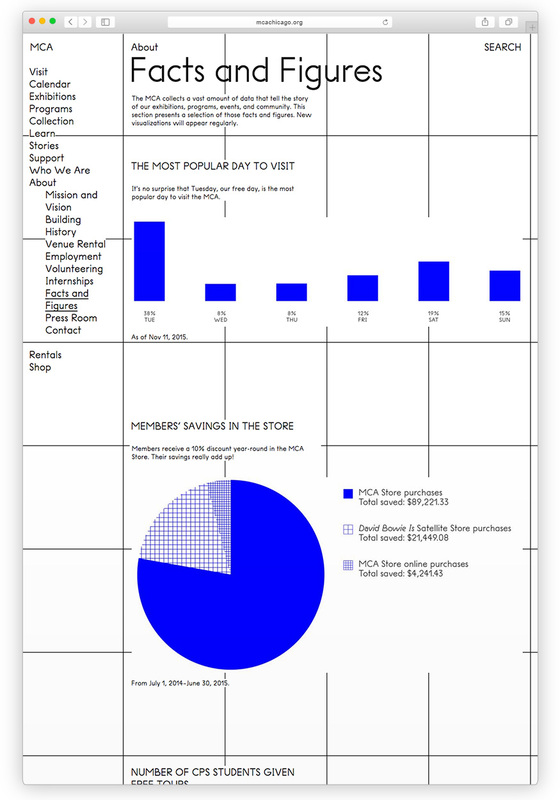 Additional contributors include Marty Spellerberg, who developed and maintained the previous iteration of our site, and Nathan White, who was responsible for development operations through the launch of the new site. 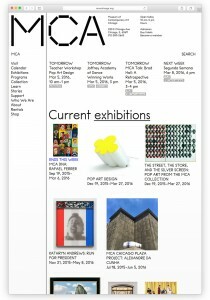 The site features a typeface designed for the MCA by Karl Nawrot. 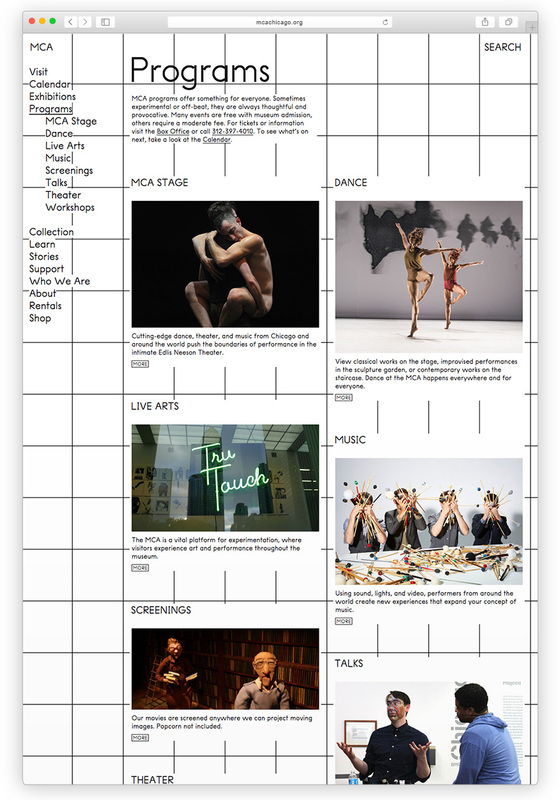 -A homepage ticker that can be used for dynamic messaging about programs and events. 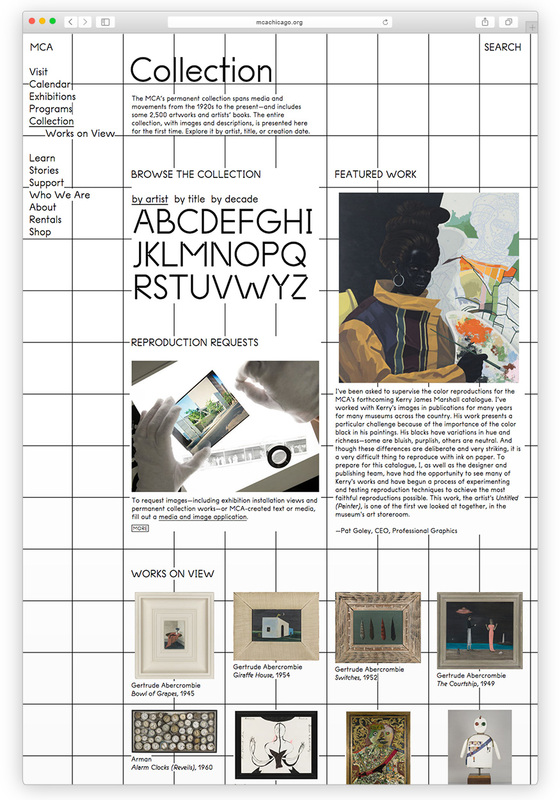 -A Collections homepage that is built to display the museum’s entire collection at a glance. 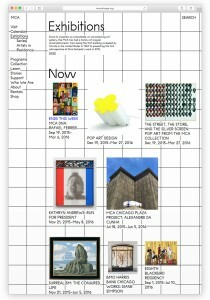 -Installation views and interpretive materials for exhibitions dating back to the museum’s founding in 1967. As with the Collections homepage, the entire exhibition history is viewable at once from the Exhibitions landing page. 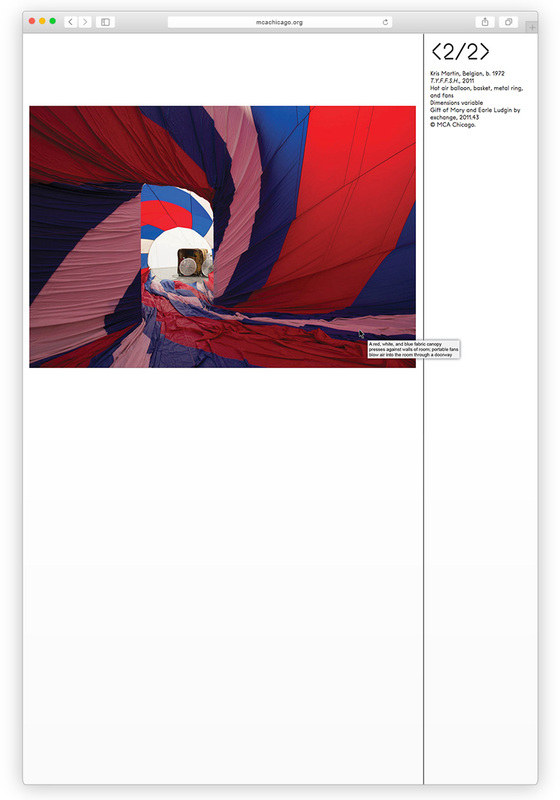 -A rare commitment to web accessibility for visitors with hearing and vision impairment, including descriptions of many of the images on the site, transcripts and subtitles for most videos and audio files, and an adherence to screen reader-friendliness that has been tested by a rigorous panel of reviewers across browser and reader types. 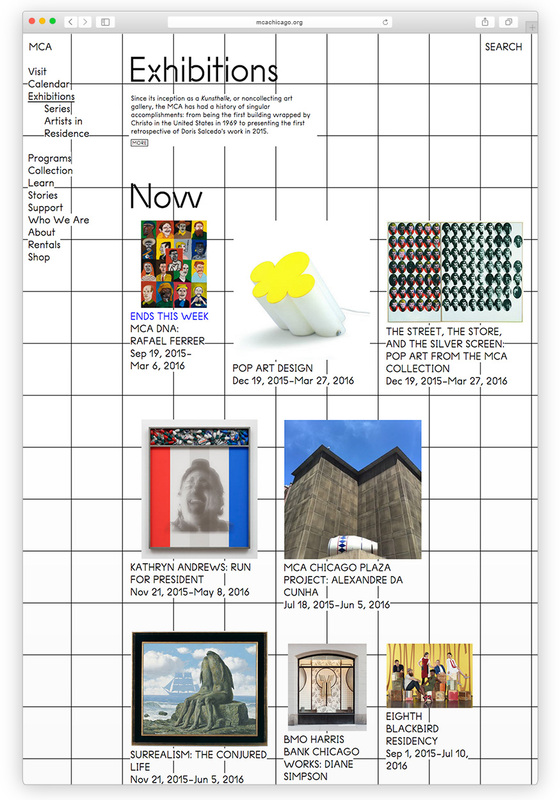 -A platform for connecting collections, exhibition, programs, publications across sections (see: https://mcachicago.org/Who-We-Are/Artists/Jason-Lazarus and https://mcachicago.org/Exhibitions/2015/The-Freedom-Principle-Experiments-In-Art-And-Music-1965-To-Now). The site has been built almost entirely on open-source technology using a combination of contract and in-house resources, and is maintained by the museum’s digital media team. The CMS is a custom Ruby on Rails web app, using mongoDB, elastic search, memcache, and an nginx server.